In 2006 the GPdotNET started as post-graduate semester project, where I was trying to implement simple C# program based on genetic programming. After successfully implemented console application, started to implement .NET Windows application to be easy to use for anyone who wants to build mathematical model from the data based on genetic programming method. In November 2009 GPdotNET became an open source project, by providing the source code and installer. Since then I have received hundreds of emails, feedbacks, questions and comments. The project was hosted on http://gpdotnet.codeplex.com. In 2016 I decided to move the project to GitHub for better collaboration and compatibility, and can be found at http://github.com/bhrnjica/gpdotnet. However, for backward compatibility, the old hosting site will be live as long as the codeplex.com would be live. Since the beginning of the development, my intention was that the GPdotNET would be cross-OS application which can be run on Windows, Linux and Mac. Since version 2, GPdotNET can be compiled against .NET and Mono, and can be run on any OS which has Mono Framework installed. Beside this fact, vast majority of users are using GPdotNET on Windows OS. 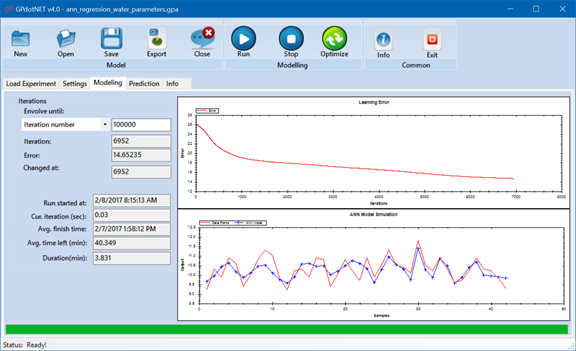 GPdotNET is primarily used on Academia by helping engineers and researchers in modelling and prediction various problems, from the air pollution, water treatment, rainfall prediction, to the various modelling of machining processes, electrical engineering, vibration, automotive industry etc. GPdotNET is used in more than ten doctoral dissertations (known to me) and master thesis, nearly hundreds paper used GPdotNET in some kind of calculation. Working with GPdotNET requires the data. By providing the learning algorithms GPdotNET uses a data of the research or experimental measures to learn about the problem. The results of learning algorithms are analytical models which can describe or predict the state of the problem, or can recognize the pattern. GPdotNET is very easy to use, even if you have no deep knowledge of GA, GP or ANN. Appling those methods in finding solutions can be achieved very quickly. The project can be used in modeling any kind of engineering process, which can be described with discrete data, as well as in education during teaching students about evolutionary methods, mainly GP and GA, as well as Artificial Neural Networks. Working in GPdotNET follows the same procedures regardless of the problem type. That means you have the same set of steps when modelling with Genetic Programming or Neural Networks. In fact, GPdotNET contains the same set of input dialogs when you try to solve Traveling Salesman Problem with Genetic Algorithm or if you try to solve handwriting recognition by using Backpropagation Neural Networks. All learning algorithms within GPdotNET share the same UI. 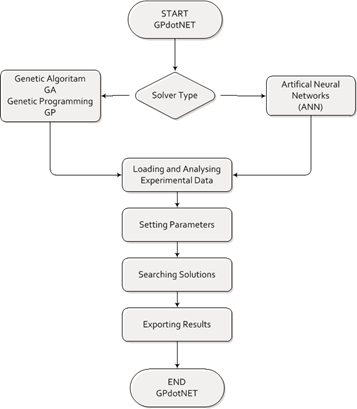 The picture below shows the flowchart of the modelling in GPdotNET. The five steps are depicted in the graphical forms surrounded with Start and Stop item. After GPdotNET is started main window is show, and the modelling process can be started. The first step is choosing the type of the solver. Which solver you will use it depends on your intention what you want to do. Choosing solver type begins when you press "New" button, the "GPdotNET Model creation wizard" appear. Soler types are grouped in two categories. The first group (on the left side) contains models implemented prior to v4.0 version. It contains solvers which apply GP in modelling regression problems, and GP in optimization of the GP models. In addition, you can perform optimization of any analytically defined function by using "Optimization of the Analytic function". Also, there are three linear programming problems which GPdotNET can solve using GA.
On the right side, there are two kind of solvers: GP or ANN, which are not limited to solve only regression. 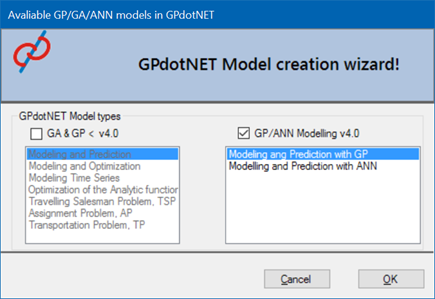 Both GP or ANN can build model for regression, binary or multi-class problems. Which type of problem GPdotNET will use, depends of the type of the output column data (label column). 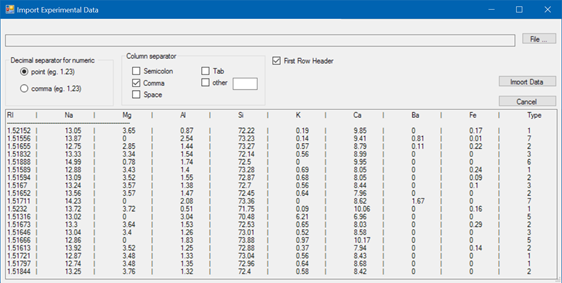 GPdotNET uses powerful tool for importing your experimental data regardless of the type. You can import numerical, binary or classification data by using Importing Data Wizard. With GPdotNET importing tools you can import any kind of textual data, with any kind of separation character. After the data is imported in forms of columns and rows, GPdotNET implemented set of very simple controls which can perform very powerful feature engineering. 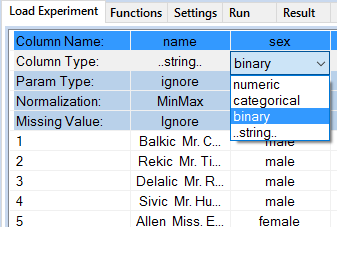 For each loaded column, you can set several types of metadata: column name, column type (input, output, ignore), normalization type (minmax, gauss), and missing value (min, max, avg). With those options, you can achieve most of the modelling scenarios. Before "Start Modelling" minimum conditions must be achieved. At least one column must be of "input" parameter type. At least one column must be of "output" parameter type. in case of regression problems ouput column must be of numeric type. in case of binary classinfication output column must be of binary type. in case of multi class classinfication output column must be of categorical type. When the column should not be part of the feature list, it can be easily ignored when the Column Type is set to "ignore", or Param type is set to "string". Change value of metadata by double click on the current value, select new values from available popup list. When you done with Feature Engineering press "Start Modelling" button and the process of modelling can be start. Note: After you press Start Modelling button you can still change values of metadta, but after every change of the metadata values, Start Modelling button must be pressed. After data is loaded and prepared successfully, you have to set parameters for the selected method. 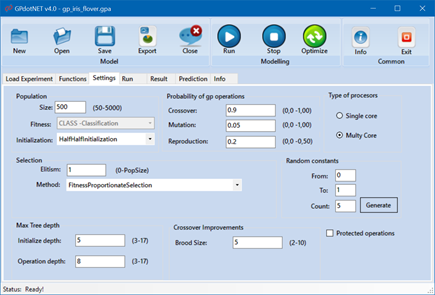 GPdotNET provides various parameters for each method, so you can set parameters which can provides and generates best output model. Every parameter is self-explanatory. GPdotNET provides visualization of the searching solution so you can visually monitor how GPdotNET finds better solution as the iteration number is increasing. 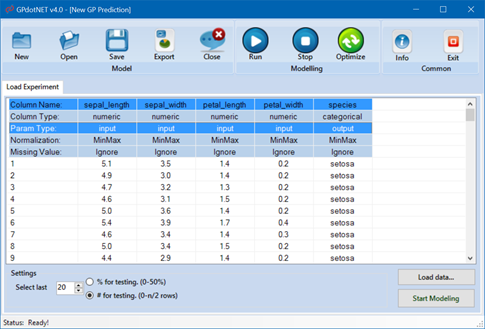 Beside searching simulation, GPdotNET provides instant result representation (only GP models), so any time the user can see what is the best solution, and how currently best solution is good against validate or predicted set of data. (Result and Prediction tabs). GPdotNET provides several options you can choose while exporting your solution. 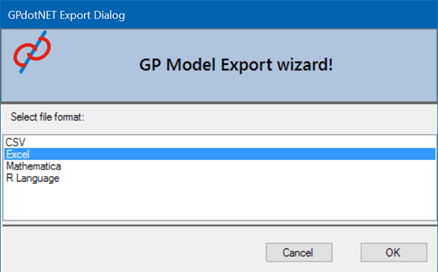 You can export your solution in Excel or text file, as well as in Wolfram Mathematica or R programming languages (GP Models only). In case of ANN model the result can se exported only to Excel. Besides parameters specific to learning algorithm, GPdotNET provides set of parameters which control the way of how iteration process should terminates as well as how iteration process should be processed by means of parallelization to use the multicore processors. During the problem searching GPdotNET records the history, so you can see when the best solution is found, how much time pass since the last iteration process start, or how much time is remaining to finish currently running iteration process. 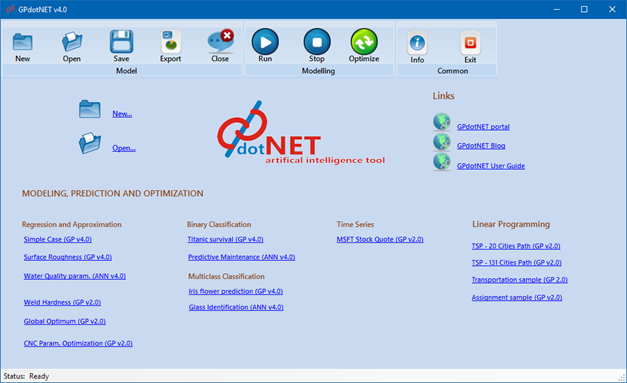 In case you have no data or just want to test the application, GPdotNET providers 15 data samples for demo purposes. All samples are grouped in problems specific groups: Approximation and Regressions, Binary Classification, Multi-class classification, Time series modelling and Linear Programming. By click on appropriate link sample can be opened to see current result and parameter values. You can easily change parameter, press Run button and search for another solution. This is very handy to introduce with GPdotNET. In any time, you can stop searching and export current model or save current state of the program. Final note: The project is licensed under GNU Library General Public License (LGPL). For information about license and other kind of copyright e.g. using the application in commercial purpose please see http://github.com/bhrnjica/gpdotnet/blob/master/license.md.